Nashville's popular West End park provides a mile-long loop for runners of all ability levels. The paved one-mile loop takes you past the lake, bridges, the Parthenon, birdlife, gardens, playgrounds and a performance stage. This city park in Nashville's lively West End packs a lake, replica Parthenon and other diverse views into a small green space. Centennial Park is accessible to runners of all levels, and wheelchair users. There is a one-mile loop trail around the perimeter of the park, and other connecting trails inside the park. All are paved and relatively flat. Centennial Park manages to pack a lot of interesting stuff into a small green space. It's an oasis in the busy cityscape of Nashville's West End, home to multiple music venues, Vanderbilt University, and diverse restaurants and businesses. The park dates back to the 1897 Tennessee Centennial Exposition, and the replica Parthenon is a striking piece of architecture left over from the Exposition. The park covers some 132 acres and is often bustling with activity on the performance stage. Shakespeare plays and a wide range of musical performances are staged here throughout the year. The one-mile paved loop trail around the park's edge gives varied views over the Parthenon, a small lake busy with birdlife, picnic shelters and double-wide wooden swingsets for a friendly break from running. Surrounding the park, Nashville's high-rise skyline provides contrast and a sense of being at the center of the city's action. The loop provides an easy and accurate way to measure the distance you are running, and for beginner runners it is a confidence boost to complete this flat and fast loop. Off the trail, there are multiple scenic green spaces and fields, with bridge features and interesting plants. Runners can take a break in these spaces to stretch, perhaps to squeeze in some yoga or meditation before or after a run. Lake Wautaga, in the middle of the park, provides a scenic backdrop. Huge old-growth trees are scattered throughout the park, providing shade during Nashville's sultry summers and interesting color during the fall foliage season. Centennial Park is also great because of it's location, location location! This very central park is convenient to homes and businesses, allowing runners to complete a quick workout without leaving the city or having to run near traffic. The park is well supplied with public restrooms and portapotties for runners' comfort, and there are well-placed water fountains so it's not even necessary for you to carry your own hydration. Centennial Park presents Nashville's diverse history in a compact space, and offers a breath of fresh air in the heart of the city. Centennial Park is a great choice for beginner runners, or those coming back to running after a break. The flat paved loop runs very fast due to its lack of elevation change. 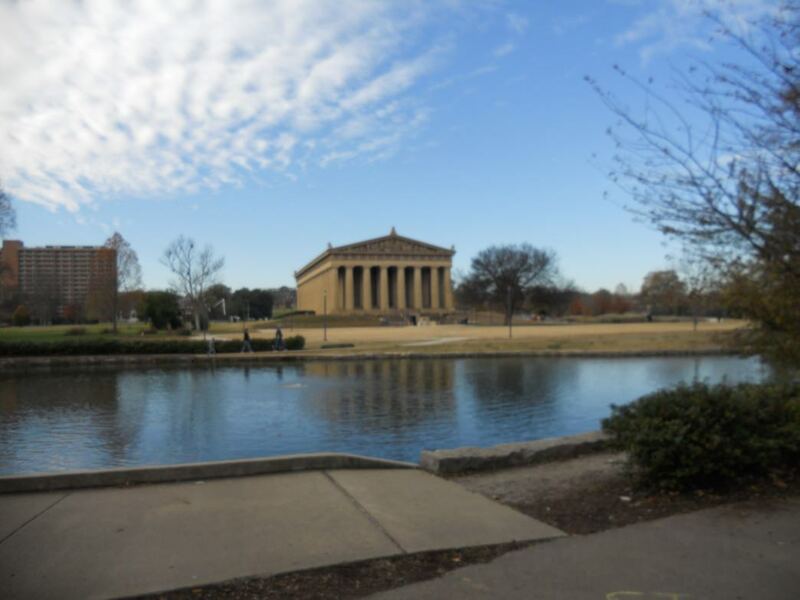 Visitors to Nashville will find this park easily accessible from downtown and the West End, and it provides off-road running without taking off into the wilderness - you are never far from other pedestrians and amenities when you are running in Centennial Park. A run around this park packs great visual interest into every mile - why slog on a treadmill when you can zip around the Parthenon on your lunch-break or before work? There's a sense of community around the park, which is usually busy with people during daytime hours. Centennial Park is Nashville's local park, and for runners it's incredibly convenient. The park suits visitors of all ages, as multiple children's playgrounds dot the loop trail. Centennial Park is slap bang in the West End neighborhood, near Vanderbilt's campus. There are 11 parking areas around the rim of the park, with a two-hour limit enforced. There is plenty of on-street parking if the designated lots are full. Bus route number 5 connects Centennial Park with downtown Nashville and the rest of the West End. The park's hours are dawn to 11 p.m. daily. Dogs must be leashed in Centennial Park, but the adjacent dog park off 31st Avenue gives your pet a place to run free. Written by J. Boxall for RootsRated.